Date: 25 July 2014. Anchor Up. I'll admit right now that I miss being underway with the freedom to simply haul in the anchor and leave! Er, and by "haul in the anchor" don't think I'm on the bow hoisting away with muscles rippling. That's for the fellows to do, and does gives us ladies something pleasant to admire. Besides, I'm past the half-century mark and basically physically phfittt! Still, I am forward with a bucket so I can rinse off the chain as it comes up. [Those anchor wash down systems surely are interesting however other things have taken financial priority and the bucket works.] When the chain first starts to come in I remove the snubber line and retie the end to my bucket handle. Then it's easy to toss over the bucket and bring up water. Sometimes it doesn't fill properly but most of the time I get into a rhythm and it fills to the brim. Hint for the bucket to fill: Make sure the handle is heavy. Thus a big knot where I tie to the handle ensures that end will sink first. I tried using a dinky brass snap but it didn't have enough heft to sink the handle and thus the bucket never filled properly. Mine is a small one gallon black bucket from the dollar store. I don't think I could handle a bigger bucket full of water as it water seven pounds per gallon and that's a lot to bring to deck level repeatedly. Also, if weather is inclement, I see no reason to leave a safe anchorage. I'll wait until conditions are spectacular because after all: I'm already where I want to be. However I have a pretty cool system for raising the anchor when I'm actively underway. Yes, by the controls to the boat is a switch for raising and lowering the anchor. That said, I prefer to be at the bow when the windlass is in motion. A friend (Doc on Safira) sold me a wired remote and it's perfection indeed. I use it and keep it handy when I'm not tied to a dock. Years ago my Daddy taught me that you should always be able to leave in 15 minutes -- regardless. That capability is one of my habits to this day. Keeping Seaweed tidy means that from decision made to departure (presuming engine is cooperative) takes less than ten minutes. I've done it in five minutes but of course by starting so quickly I run the engine slower until she comes up to temperature. 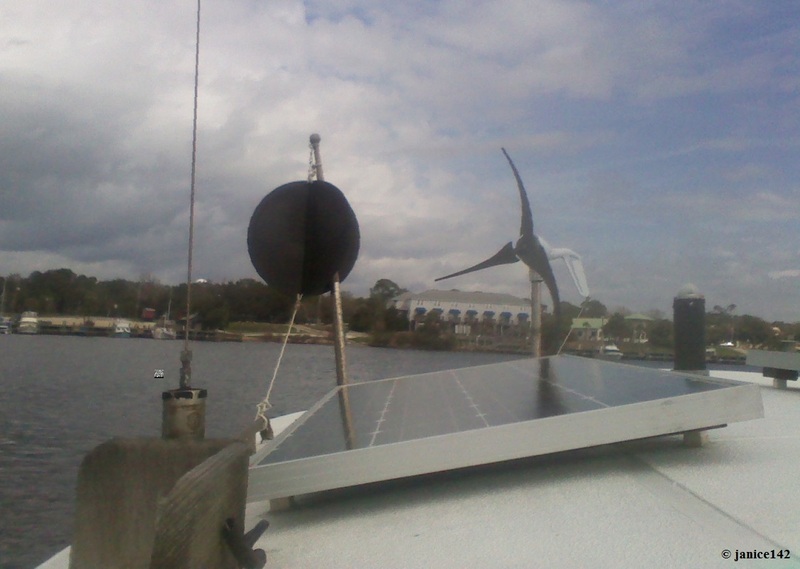 Warming the boat's motor can easily be done while cruising -- and who wants to idle a motor and go no place?!? Also, those nerves I mentioned in Boat Buying with your New Partner are not an issue when I'm already underway. There's no time to worry. I'm on my way and life is so nice aboard a boat in motion. Note time for the Log Book. Turn on Computer and make sure OpenCpn is on, and that the computer attached GPS is functioning. Open paper chart-kit to proper page. Confirm my pencil is ready (I write on my real charts as I proceed so I have a paper trail. I'm well aware that computers are far more reliable than they were once. Still, I like being able to see the Big Picture -- and for me that means a paper chart opened to my location. Also there is a certain pleasure in moving from one paper chart to the next. It means progress is being made. I have a hard-wired remote. When underway the windlass remote hangs here (#1) on this hook inside my hatch with easy access from the forward deck. Yes, I've got the switch there at the helm, but prefer to be on the bow for the anchor up procedure. (#2) My remote is on (#3) box holding the solenoid which is one electrical component of the windlass. 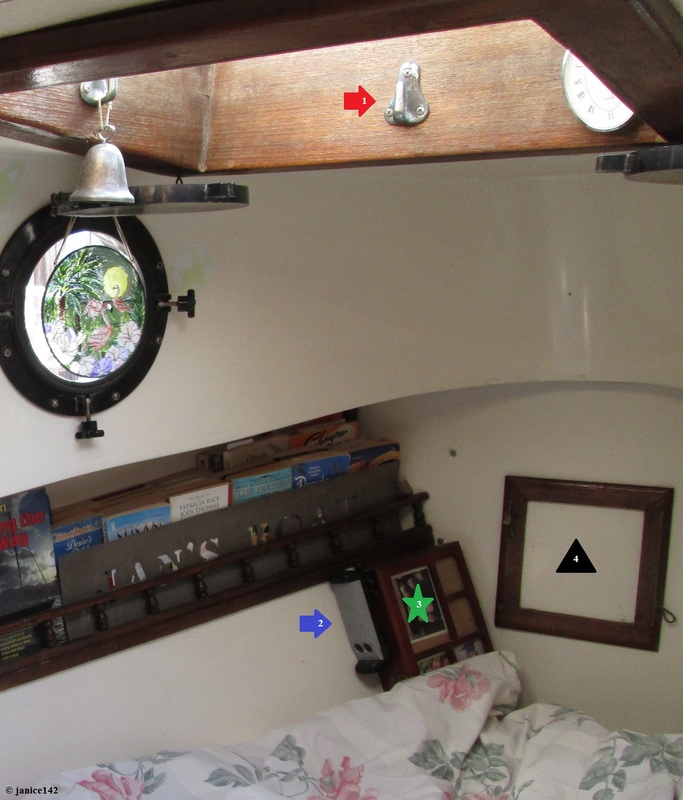 #4 (the black triangle) is access to my anchor locker. Originally it was held in place by four screws. 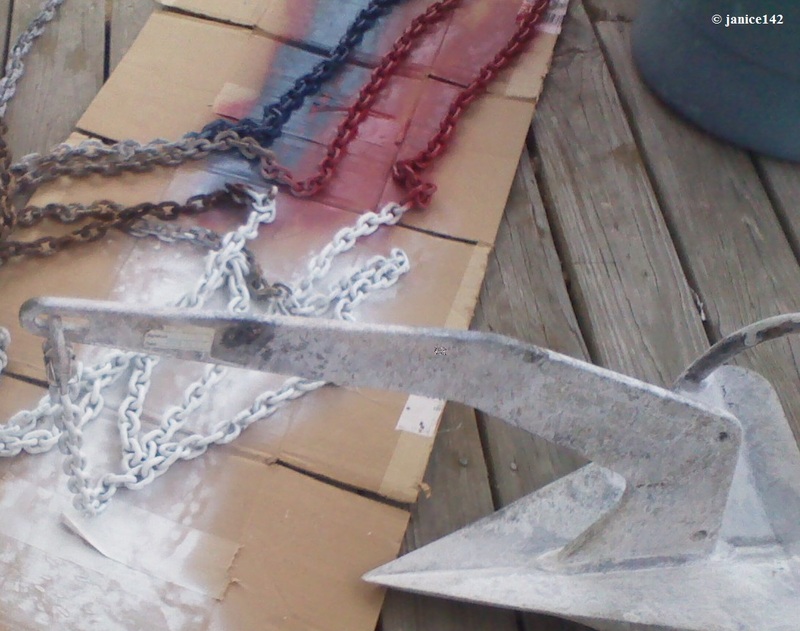 This last time I was at the dock I painted the first three feet of chain white. That makes knowing when the anchor is almost up easy to determine. I should have done that long ago. The first three feet are painted white. From 24' though 26' is painted Red. From 49' through 51' is painted White. From 74' through 76' is painted Blue. From 90' through 97' is painted White. The final 3' is Red. Red, White and Blue is easy for me to remember. When I'm tired I don't have to think what comes first. That final White gives me a head's up that I am coming to the end of the chain. At the end of the chain I attached a 20' piece of 1/4" braided line that is loosely tied to the inside of the anchor locker. IF I ever had to "drop the anchor" (leave the anchor behind) I could easily tie a fender to the end of that line, and hopefully retrieve the anchor and chain later. The braided line also gives me a way to "catch" the chain should it go completely out of the windlass. I still have a connection to the chain and can feed it back into the windlass and try again. 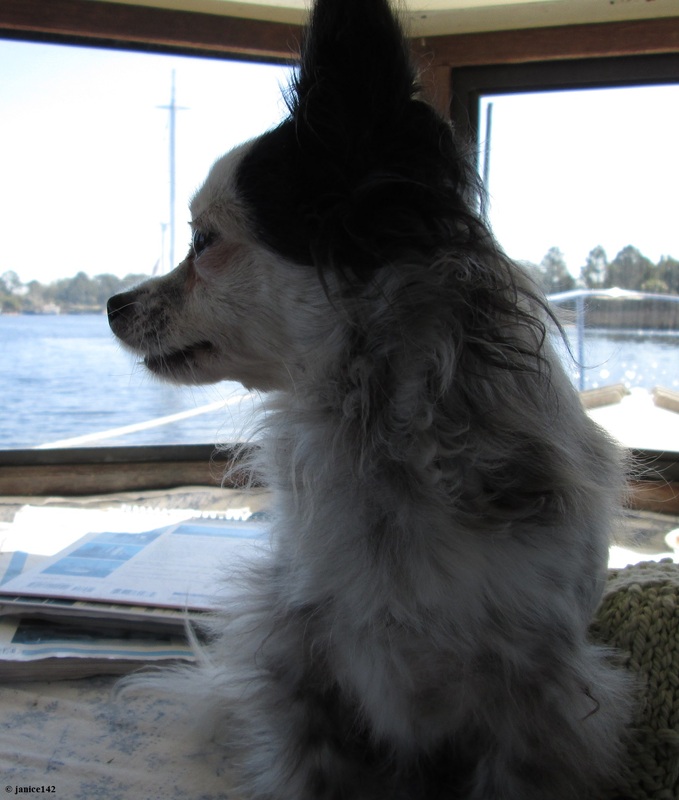 I would not attach the chain permanently inside my boat -- there's too many things that can go wrong with that. The long braided line is so I can untie the line and re-tie it to something that floats. And hopefully I'll never have to test that system! For retrieval however, simply rinsing the chain as it comes up is all it takes. After the chain is secured and the anchor back on deck there's only one more thing to do: Take down the anchor ball. The black anchor ball is supposed to be displayed in the daytime when you're at anchor. Now I'm ready to head out the channel. Where to? Just a bit further. I'm certain folks deploy and retrieve from their controls. I don't. 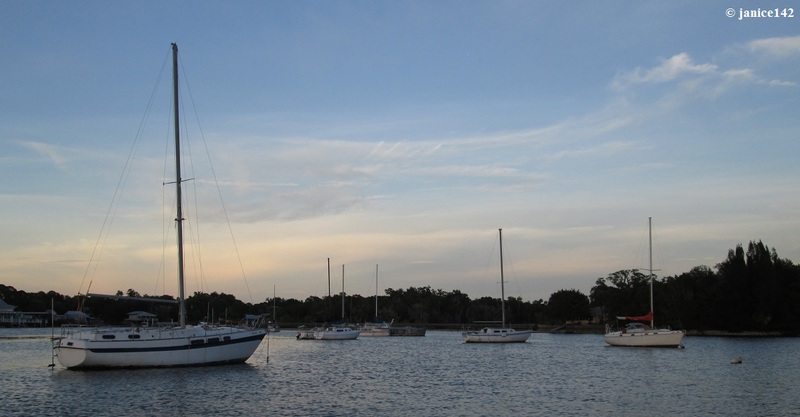 Do you have an anchor ball aboard your boat? In your area, are they displayed regularly or is it just an occasional boat with one showing? A favorite aphorism: I wanted to do something nice, so I bought my mother-in-law a chair. Now they won't let me plug it in. Henny Youngman.